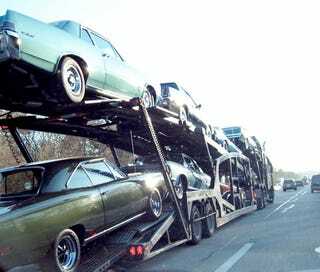 Can You Identify All The Collector Cars On These Dreamer Carriers? What happens when you take two car carriers full of classic cars and post the pictures on Jalopnik? We're guessing productivity is going to drop at America's best businesses and places of higher learning. Talk about right place at the right time, UDMAN happened to be driving along I-95 in Rhode Island to catch the 18 dreamy autos. We've got a good idea of what they are, but we've been wrong before. This is a collective challenge so everyone is encouraged to work together to make the identifications.